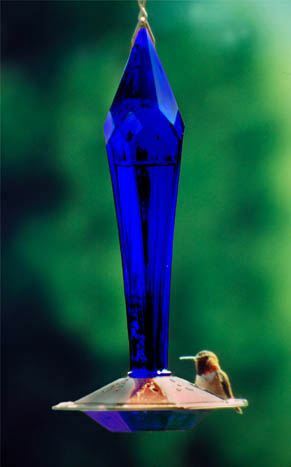 This beautiful cobalt blue colored glass hummingbird feeder has a finely crafted solid copper base which allows hummingbirds to perch while feeding through opencut sunlit flower ports. This Friendly Habitat Collection humming bird feeder will fill your outdoor habitat with a flash of color and the whimsical activity of feeding hummingbirds. Decorative as well as function, this truly original glass and metal hummingbird feeder is sure to please as beautiful hummingbirds gracefully dart across your garden. Easy to fill and clean, and leak free, this feeder measures approximately 12 inches. It comes new in the box with a copper chain, ready to hang and start attracting hummingbirds to your yard. This would be a wonderful addition to your own backyard, or a great housewarming or other gift for someone special.. The dish cover is solid brass with 3 kiln fired, red powder coated copper flowers attached as the feeding ports for these humming bird feeders.